The U.S. Navy’s new Zumwalt-class is the next-generation in destroyer technology. 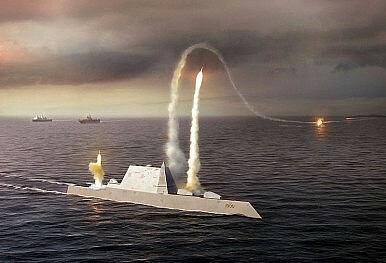 On Monday, the U.S. Navy launched its radically futuristic new stealth destroyer – the USS Zumwalt. The ship is captained by the aptly-named Capt. James Kirk, and the first Zumwalt-class destroyer in operation. The Navy expects to ultimately deploy up to three Zumwalt-class destroyers. While the Zumwalt is the U.S. Navy’s do-everything ship in many ways, it was designed with land attack in mind. Given that the Zumwalt's overt design attempts to overcome China's much-touted anti-access/area-denial (A2/AD) strategy, the launch of the ship will be closely watched by the PLA Navy. It’s considered to be a “next-generation” destroyer with a design that reduces its signature, and an incorporation of active and passive self-defense systems. It represents the culmination of over two decades of research and development. The Zumwalt in reality represents the very frontier of destroyers, and in actuality resembles a battleship in more ways than one. Most notably, its sheer size puts it at a few feet short of being classified as a battleship. The Zumwalt incorporates enough power to match its hefty size. The addition of the Zumwalt hones the U.S. Navy’s technical ability to make good on its Air-Sea Battle (ASB) strategy, including Joint Operational Access. The development of the Zumwalt hasn’t been free of political controversy. In an era of tightening defense budgets and spending, the program came under fire from budget hawks in Congress who have found its return on investment value to be unsatisfactory. But the ship also has its proponents on Capitol Hill. Rep. Randy Forbes (R-VA), chairman of the House Armed Services Seapower and Projection Forces Subcommittee and chairman of the Congressional China Caucus, has heralded the Zumwalt as precisely the sort of hardware the U.S. Navy needs to incorporate to ensure its dominance. What Should the US Navy's New Large Surface Warship Look Like? The U.S. Navy has some big decisions ahead of it.